Scientists have long searched for proof of alien life, yet it remains unknown if other beings have ever existed outside of our planet, or if life on Earth is truly alone in the universe. Now, researchers say Earthlings may just have arrived early. On a cosmic timeline, a new study argues that life on Earth may be premature, and say other potentially habitable worlds could one day produce life given enough time – roughly 10 trillion years. In a paper published to arXiv, researchers analyzed the factors necessary for the emergence of life, citing the lifetime of a planet’s nearby star as a dominant element. While some scientists have argued that alien life may have preceded us by billions of years, the researchers from Harvard and Oxford Universities say the opposite could be the case. ‘If you ask, ‘When is life most likely to emerge?’ you might naively say, ‘Now,’ says lead author Avi Loeb of the Harvard-Smithsonian Center for Astrophysics. The emergence of life is dependent on a planet’s star, the researchers explain. Not only must the star survive long enough to allow the planet to form, but it must also allow for enough cooling afterward to create liquid water on the surface. After the Big Bang, it took roughly 30 million years for the first stars to form, and our own planet wasn’t birthed until 4.6 billion years ago. ‘Life requires stars for two reasons,’ the authors explained. ‘Stars are needed to produce the heavy elements (carbon, oxygen and so on, up to iron) out of which rocky planets and the molecules of life are made. Through their analysis, the researchers determined that stars with a higher mass will have a shorter lifetime; those more than three times the mass of the sun will die out before life can ever evolve. The researchers say stars with a higher mass will have a shorter lifetime, dying out before life can emerge. Smaller stars weighing less than 10 percent of the sun’s mass can survive for 10 trillion years, providing enough time for life to emerge. The chance of life is 1000 times higher in the distant future than it is now, the researchers say. Based on the findings, they say life on Earth may have emerged prematurely on the cosmic timeline. But, they say it is also possible that the environment around low-mass stars are too hazardous for life. On a cosmic timeline, the researchers argue that life on Earth may be premature, and say other potentially habitable worlds could one day produce life given enough time – roughly 10 trillion years. But, smaller stars weighing less than 10 percent of the sun’s mass can survive for 10 trillion years, providing enough time for life to emerge. Over time, the chances of life become much higher – 1000 times higher in the distant future than it is now, the researchers say. ‘So then you may ask, why aren’t we living in the future next to a low-mass star?’ says Loeb. ‘One possibility is we’re premature. Red dwarf stars are low-mass and have a long lifetime, but they give off strong flares and ultraviolet radiation early in their existence that could destroy the atmosphere of a planet in the habitable zone. 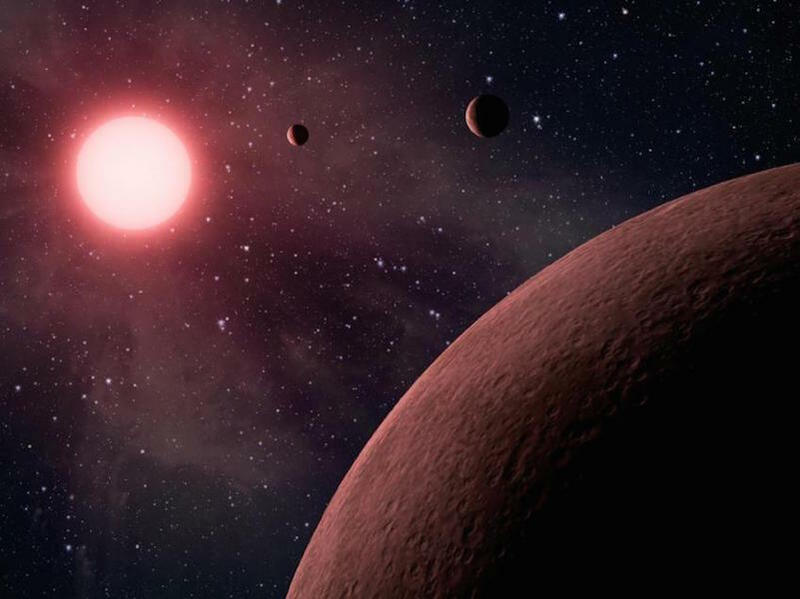 The researchers say future studies of nearby red dwarf stars could help to determine which scenario is correct, through missions like the Transiting Exoplanet Survey Satellite and James Webb Space Telescope.